I use WRAP daily to manage the symptoms of my bipolar. I know what I look like when I am well and when I have been triggered. I work hard daily to use my WRAP program as well as medication and therapy, to manage a very difficult form of this disease. I walk daily now, watch my diet as well as caffeine intake. I keep a daily schedule and it is working. 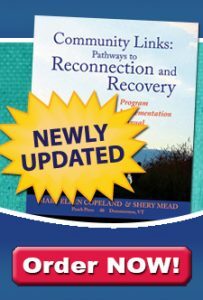 I so appreciate WRAP in my life and feel fortunate to have learned this recovery tool. WRAP saved my life. I had 15 suicide attempts, and had given up on life. I had become my illness, and did not see a way out. With WRAP, I was able to see that I was competent, and that I could find new ways to deal with my depression and mood swings. I was introduced to WRAP at the VA hospital in Portland, Oregon in the Footsteps To Recovery program. Pam is one of the staff and she taught the course. I am now using the on-line version to make it easier to get the information developed in the class to my care givers. I suffer from major depression and the way WRAP is set up it has allowed me to be able to have a visual aid to daily look at and something to refer to when things start to go bad. My girlfriend has found it useful because she can question me when she begins to notice things listed in my WRAP. I love the program and talk about it to everyone and highly recommend it as a excellent tool for dealing with depression and other mental health challenges. My arthritis is in remission thanks to two things, science and biological drugs that suppress my immune system and yes science and drugs are a vital part of my WRAP, but equally important is my plan of care which incorporates diet, exercise and some balanced thinking to this diagnoses so I didnt become a “patient” but a person who lives a good life despite arthritis. If I said WRAP was life changing for me it wouldn’t do WRAP justice, I can honestly say WRAP gave me the freedom to be who I want to be, and yes I met challenges, but there are many routes to getting to your destination and I choose the positive one. WRAP is freedom of choice within the mind, where it counts most. I have mental health challenges with accompanying substance use. I found it very difficult to deal with my substance use effectively until I reached a greater understanding and deeper acceptance of my overall mental health picture. As far as diagnosis, I am challenged with bi-polar depression and drug addiction. I am in blessed recovery from both, and WRAP has been instrumental. I have been using WRAP for about three years now. I was introduced to it by a therapist. Then good fortune had it that the Wrap Around The World Conference was in Philly in 2011. I completed a WRAP Seminar I there and went on later that fall to become a WRAP facilitator. I also have a WRAP Pal. I love teaching WRAP and sharing WRAP in Crisis Centers, Emergency Rooms, Inpatient and Outpatient! Thank you Mary Ellen. I’m suggesting jails and inpatient hospitals to get the WRAP PLUS. It is crucial. I have used my WRAP to deal with diabetes, end stage renal disease, and now a kidney transplant. I has empowered my to speak up about my medical care as well as my mental health care. It has helped me keep organized. I had to have a complicated crisis plan because only certain hospitals take someone with multiple health issues for mental health treatment. If I had not had WRAP as a dialysis patient I think I would have lost any mind I had left. At some point when you are so chronically ill I think people begin to feel like a diagnosis (does that sound familiar) and WRAP reminds of our humanity and our dignity and personal power. I see people go from thinking they have no hope and support to having it in abundance. I use WRAP to help me manage depression, anxiety, PTSD and my chronic migraines. WRAP helps me prevent migraines through using Wellness Tools and watching for triggers that will bring on an attack. if it wasn’t for the help that I have received and WRAP which I have also taught here to several counselors and to clients, I would not have made it thus far in my life. I’ve been coordinating my WRAP for almost ten years, and facilitating WRAP for nine, and I find that I live in a state of balance and well-being most of the time. I have more time to reach out to others because I am more adept with handling challenges in my own life. Becoming a collector and user of Wellness Tools has made me noticeably more resilient, optimistic, creative, and flexible. I was so excited about WRAP when I first became aware of it for people I was doing therapy with. I decided to become a facilitator and of course in that process wrote my own WRAP. My best friend since we were six died in the middle of the class I was attending. The WRAP group and writing my own helped me get through that as well as other personal and national catastrophies that year (2001). I have been using WRAP to help my son (He will be 3 years old in March). We have been struggling for awhile now, they think he is on the autism spectrum. We are in the process of seeing specialists and getting a diagnosis. WRAP has helped us cope, manage behaviour, and recognize his Triggers. We now have an Action Plan!!!!! It has been such a blessing. WRAP has also helped my daughter (5 years old) in understanding some of her brother’s struggles and setting aside special Wellness Tools just for her. My husband and I know have a plan and can respond to our son’s struggles. We feel more prepared and it has given us Hope back for his future. Once again, WRAP has changed a life and saved a family. In the beginning it was a harship for me. I went through times of suicidal feelings and ideations. I really felt like I was at a dead end street. I then finally met up with a facilitator of the W.R.A.P. program here in Waterbury, Ct.. I started taking the class. As I was doing my post crisis plan, I thought of something. I then said out loud, “I can do this”. “I can succeed”. So up to this point in time, I’m still practicing my wellness toolbox, and diversions, and affirmations to get me through the tough times. Today, I am doing volunteer work at a salon, and I see my therapist every Monday. I go to med review once every 90 days. I just moved this past October to a beautiful apartment. It’s huge. I have it all decorated to my liking. I’m a lot happier now. I don’t let the people that choose to be negative bother me. For awhile my cousin and I weren’t getting along and she’d call me names along with threatening to end my life. I just ignored it and went my own way. Since my cousin and I are on non speaking terms, I’m doing a lot better mentally, emotionally, and physically. So that there is a plus. The only thing I have to work on is my weight. I want to get back down to 119 lbs.. I want to thank Mary Ellen for inventing the WRAP program because to me it is very helpful. I would definitely recommend others that I meet that are struggling to utilize your prgram for a major step in mental health recovery.